Let’s get one thing straight, Era Vulgaris is a pretty tremendous record. Their fusion of drag race chic and motorik beats injected with wry humour and subtle menace is as addictive as ever. Sure, it might lack some of the weight and bluster of previous adventures, but given the quality of their accomplishments - 2000’s Rated R and 2002’s Songs for the Deaf are two of the greatest rock albums of the last 25 years - you wouldn’t have been surprised if they just retired back onto their laurels and rehashed said albums ad infinitum. 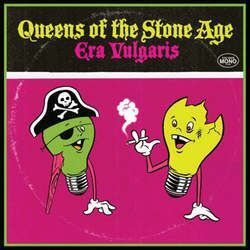 While Josh Homme’s desire to make perfect ‘robot rock’ remains unswerving, Era Vulgaris is a more complex, textured record than anything else they’ve done and relies less on the riff and more on the song for effect. This puts paid to some of the palpable danger that made past glories so appealing, but what comes in return is a more varied record filled with a greater melodic certainty. Maybe Queens ‘the pop years’ will come next time. Josh Homme brings his hip'n'heavy rock'n'roll band round again.